After discussing one of our new favorite Maida Heatter recipes, Big Surs, Sue and I moved onto the topic of how the baking sheet one uses affects the crispiness of cookies. Sue typically uses AirBake cookie sheets to avoid burnt bottoms. To see how it affected crispness, Sue baked her usual Snickerdoodles on a regular flat cookie sheet. Success! They were definitely crisper. Alas, this test was not so scientific because she also chilled the dough. So technically the results suggest that if you chill the dough AND bake on a non-AirBake cookie sheet, cookies may be crisper. Want a better answer? Bake some Snickerdoodles for yourself! Here’s the recipe Sue uses for very delicious and crispy Snickerdoodles. These cookies are amazing! I have never made Snicker-doodles before and these were picture perfect gorgeous and tasted even better than they looked. A slight crisp, but were mostly chewy. I didn’t have cream of tartar so I substituted that and the baking soda with 3 1/4 teaspoons of baking powder. My boyfriend did the conversion and it seemed like a lot, but the cookies were perfect. The restaurant I work at has Snicker-doodles delivered from a local bakery and I always bring one home for my bf. Today we ran out and I felt like baking anyway. Of course I went to your site to find a recipe. I was scared to have my first attempt go against a bakery cookie, but my bf liked these more! Thank you so much for your amazing blog. I wrote a comment last night and deleted it because I’d had a glass of wine and it sounded like a crazy rant. But what I wanted to say was I liked the article a lot until Page 6, at which point it became somewhat bleak and brought to mind a movie called Idiocracy, which made me laugh but which was too cynical to take seriously. Still, makes you wonder… I think the article also put a lot of weight on TV. TV, to me, is entertainment. Books, schools, parents are better teachers when it comes to skills.. Sesame Street helped me learn the ABC’s, but my parents didn’t rely on it to teach me to read. The article’s a great talking point, but not necessarily on food forums because people will come off sounding sanctimonious – whatever side they are on—even if they don’t mean to. Better to discuss in real life, unless you have a way with words like MP. I like how he lays out facts (some eye-opening, like the 4 minute average clean-up time) without sounding too judgmental. And I like how he uses his son in examples. And I don’t like the term “stir-and-dump” but that pie was stir-and-dump at its finest. Anna, love the icon on the right that leads to a summary page of your postings. That way, if I’ve been out of town and have missed your blog I can see exactly what you’ve baked! If this feature was available before, I never knew about it. Hi Anna, Love your new look!! Checked out the snickerdoodle recipe with the baking tips. I make these cookie alot so I’ll definitely be trying the new ideas. Thanks!! Haha–thanks Katrina. I’m repossessing my Internet account to say that both the cookies and pie look awesome–you know I’ve never made or had snickerdoodles. Something new to try–both the pie and the cookies look like awesome summer desserts. I actually heard an interview with Michael Pollan talking about how his son loves Fruity Pebbles and spray whipped cream (although probably not at the same time) and how embarrassed he is when he has to buy them for his son’s weekly ‘treat’ meals. I think the pie looks saintly in comparison to Fruity Pebbles! HeartofGlass, too funny, your comment! Anna, my sis-in-law told me their favorite cookie at this house is snickerdoodles and I can’t leave until I make some. It’s on the agenda for Thursday! Thanks for the link! I hope your readers like the cookies. The pie actually looks like it would be tasty! Mindy, make a batch and get back to me. A well made snickerdoodle is a fabulous thing. Louise, that makes me feel a little better. Thanks. I still think my pie sounds more pre-fab than yous, though. Alexandra, thanks for the compliment. Things are coming along with the new design. Kerstin, I will link to it. Mary, please don’t let the ghost of Julia Child (or Michael Pollan) see this link. Here’s the pie. I DID grind the graham crackers myself ;). And I have to say, Todd liked this. 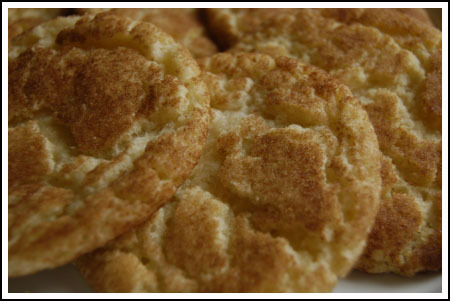 Ahhhh, snickerdoodles make me think of my lovely Mom. She would bake these for me, just pulling them out of the oven when I go home from school. I loved then and I love them now. Thanks for the walk down memory lane! This is Jooo-li-ah Child, using Mary’s Internet account to saaay you shouldn’t feel bad t’all about using froozen pie crust, Aaaah-naaa because allll of your desserts look soooo beau-ti-ful, and your filling is certain to be sooo scrumptious, no one will know! Mmm, what perfect looking snickerdoodles! Sometimes we all need a an easy pre-fab recipe – you should post it! I’m loving the new look of your site!!! Oftentimes I read your blog from my blackberry so I didn’t catch CookieMadness’s new sleek and chic look- wow nice job! And delicious snickerdoodles too! Go Anna Go! Anna, these look great. I’ve always had an aversion to Snickerdoodles because when I was growing up this lady in our neighborhood would always bake them for various families (unfortunately including mine), and they were just terrible. I think I may need to try them again…you know, make them myself…before I automatically categorize them as “YUCK” cookies.